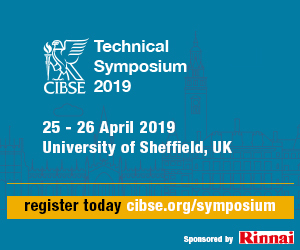 ‘The key M&E design challenge was to meet the exacting environmental conditions demanded by various elite sports while minimising annual energy consumption,’ says Mark Palmer, senior partner at consulting engineers Max Fordham. Palmer is talking about Oriam Sports Performance Centre, which opened in autumn 2016 at Heriot-Watt University’s Riccarton campus, west of Edinburgh. The new sports complex is a training base for Scotland’s national football and rugby teams, offering state-of-the-art changing rooms, hydrotherapy pool, strength and conditioning gym, and a FIFA-accredited indoor synthetic pitch – the largest of its kind in Europe. These facilities are also used by Heart of Midlothian FC, Hibernian FC, Edinburgh Rugby and English Premier League football teams for their pre-season training. 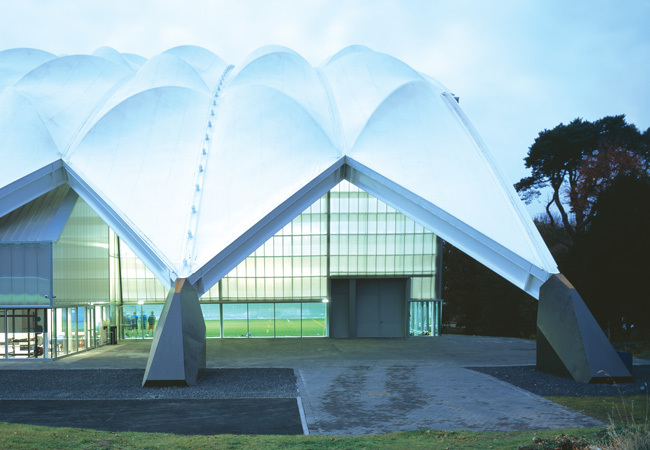 In addition to football and rugby, Oriam is used as the training home of Scotland’s national governing bodies for basketball, handball, squash, racketball and volleyball. Oriam was designed to offer an inspirational environment for all levels of sporting activity, including the local community, university students and top international athletes. Max Fordham developed the centre’s design with Reiach and Hall Architects. With so many sports housed in the one complex, flexibility and adaptability of environments was key to the low-energy building services design. Instrumental in achieving this aim was the use of soft landings, which was applied to all stages of the project – from the briefing with the campus estates team, the operations team and the various sports’ governing bodies through to the design development, commissioning, handover and aftercare. 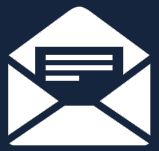 In Scotland, Display Energy Certificates (DECs) are not mandatory for public buildings, but draft versions of the certificate have been produced to benchmark Oriam sport centre’s performance. The vast area associated with the indoor synthetic pitch tends to distort the DEC rating, delivering DEC A quite comfortably. ‘Rather than sit back and congratulate ourselves on a job well done, we decided to calculate a second DEC rating, this time with the synthetic pitch area excluded,’ says Palmer. ‘The spaces had to accommodate many different sports at all levels. The main sports hall also had to be capable of being adapted to cater for large-occupancy events, such as graduation ceremonies for 850 people,’ explains Palmer. The new building was designed to link with existing facilities on the campus to form a large, integrated sports complex. 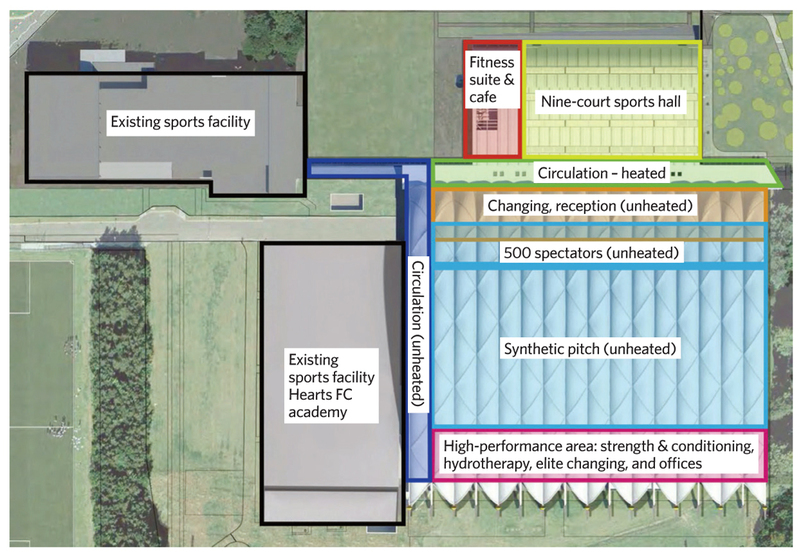 Conditioned sports accommodation and associated offices are arranged on either side of the indoor synthetic pitch, with high-performance facilities on the south side linking with the existing Hearts FC academy, and the nine-court sports hall, fitness suite and café on the north side joining up with the existing sports centre. 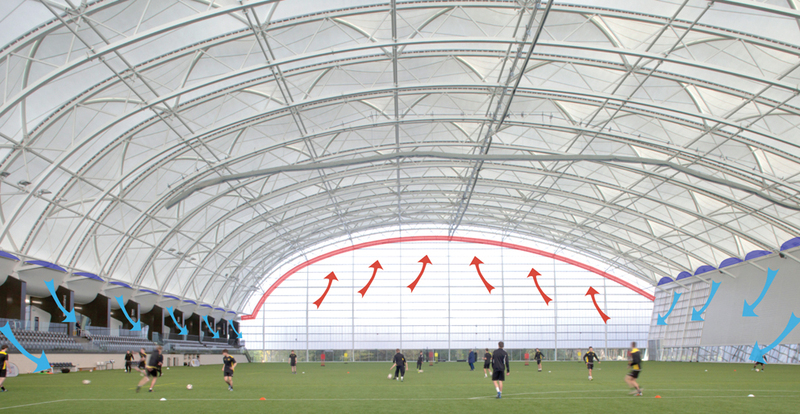 The main indoor pitch can be accessed from changing facilities on both sides. This synthetic pitch is sheltered from the weather by a giant, arching, translucent roof, held aloft on steel trusses spanning 80m and rising 29m at the centre of the arch. The space is designed to be subdivided for use by multiple teams or activities. Although the sports facilities are used by Scotland’s top athletes, it was important to ensure they also cater for recreational sports, the local community and students on campus. 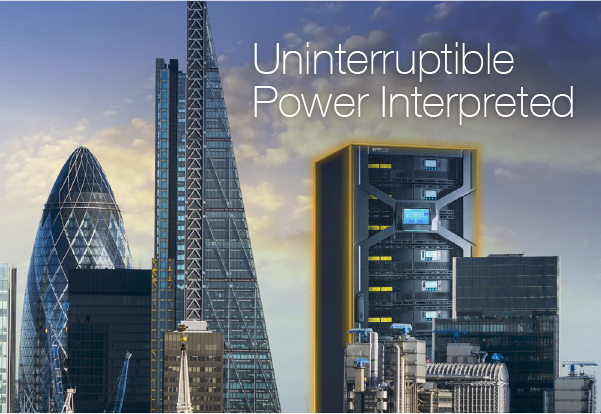 ‘Our challenge was to deliver these high-performance environments with the lowest possible energy consumption,’ says Palmer. 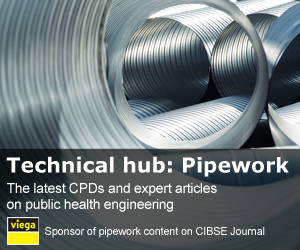 ‘To achieve this, we must first recognise that sports buildings have highly irregular use patterns, occupancies and activity – and the heating, cooling, ventilation and lighting must be set up to respond accordingly. We must also take advantage of the free heat, light and fresh air in the natural external environment whenever possible. Oriam has some huge indoor spaces, with very long hours of operation (6.30am to 10pm) which, at times, require very high levels of illumination. 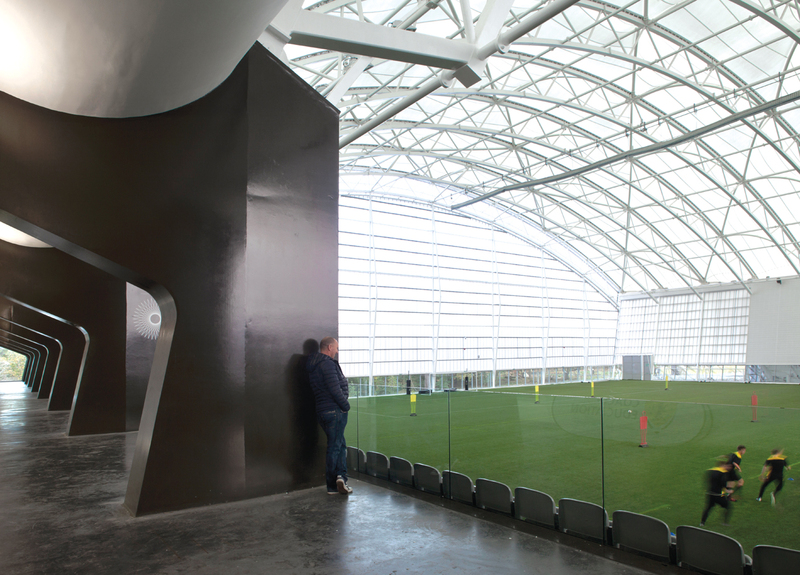 ‘Without good quality daylight and fine-tuned lighting control, the installed lighting at Oriam has the potential to consume more than £100,000 of electricity per year – this scenario is not uncommon in typical sports buildings,’ says Palmer. At Oriam, the lighting loads have been reduced by 75% compared with a typical black-box sports building, by ensuring that the lights are switched off when the daylight is available, and set to suit the occupancy and sport being played in each zone. Accordingly, Max Fordham set out to develop a design to maximise the use of daylight and natural ventilation. ‘Daylight in sports buildings is good to reduce lighting energy and create a more inspiring space, but it must be carefully designed to control unwanted glare and prevent overheating in summer,’ Palmer says. A key challenge in developing the daylight design was to meet the exacting light-level requirements demanded by the various sports bodies without glare. Modelling was used extensively to ensure the design worked. 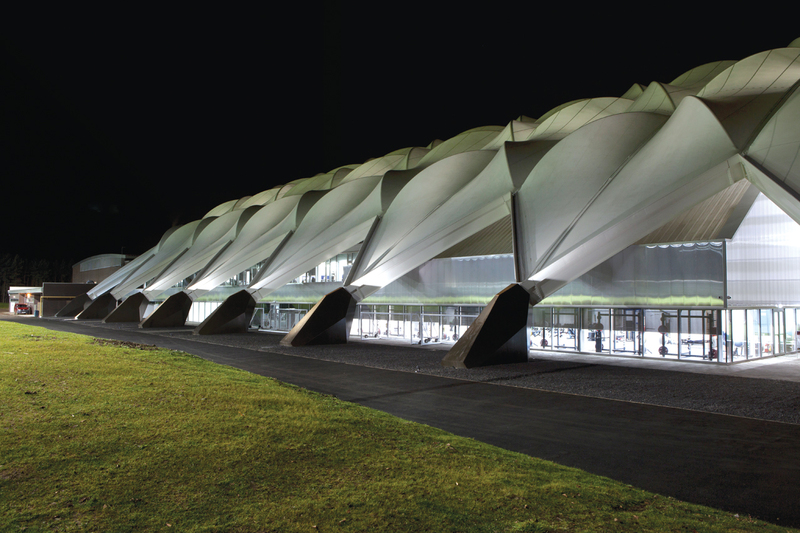 For example, the synthetic pitch uses translucent cladding and roofing materials, which mean that – for most of the year – no artificial lighting is required during daylight hours. ‘The membrane’s transparency has been tuned to control solar gain while delivering a daylight factor of 6%, sufficient to play sport without artificial lighting for the majority of the year,’ explains Palmer. Lighting controls allow artificial light levels to be easily managed between 250 lux for training purposes and 500 lux for high-profile matches. ‘An intuitive controls interface was developed as part of the soft landings process,’ says Palmer. 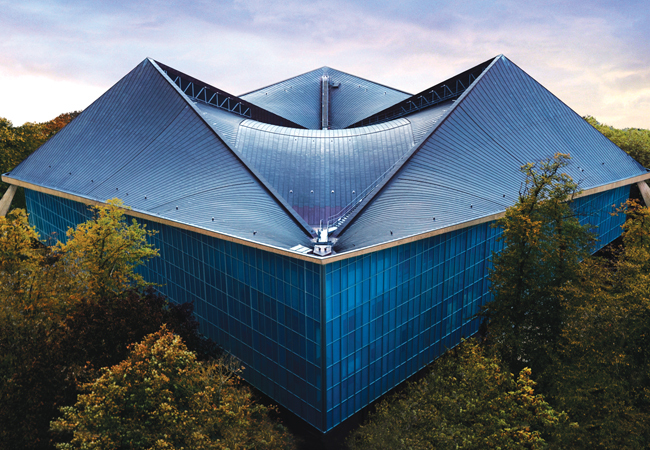 To ensure the space could operate successfully without mechanical heating or cooling, Max Fordham carried out analysis to establish the optimum balance between roof transparency and ventilation openings to avoid summer overheating. Ventilation openings have been integrated into the building envelope: high-level vents are incorporated into the gables, while lower-level vents run the length of the sides, at the roof junction with the walls. The main sports hall has also been designed to exploit daylight. It incorporates four lines of rooflights running the length of its arched roof. These are fitted with diffusing glass, which gives sufficient daylight to allow the artificial lighting to be switched off during daylight hours while controlling glare for occupants. 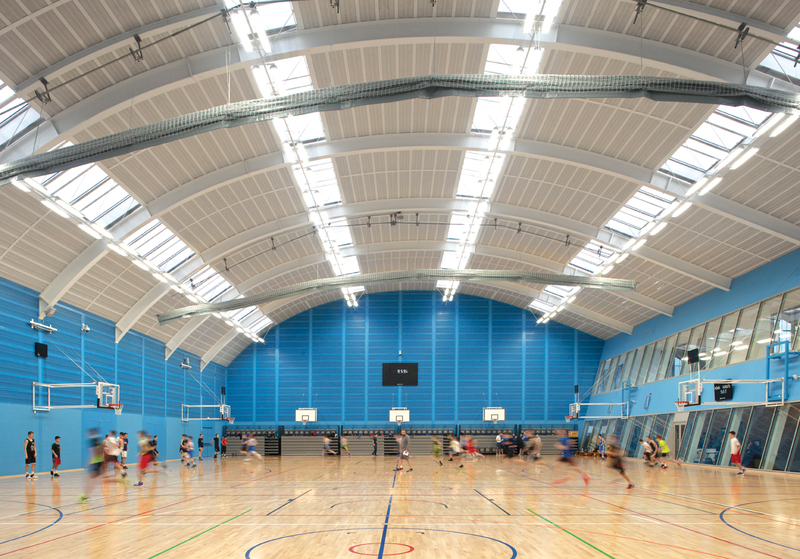 ‘Instead of a traditional black-box indoor sports hall, we persuaded the client to opt for a naturally daylit hall to save energy and create a more pleasant environment,’ says Palmer. The hall’s artificial lighting is controlled to suit the level of sporting activity and to illuminate separately each of the three zones when dividing nets are deployed. 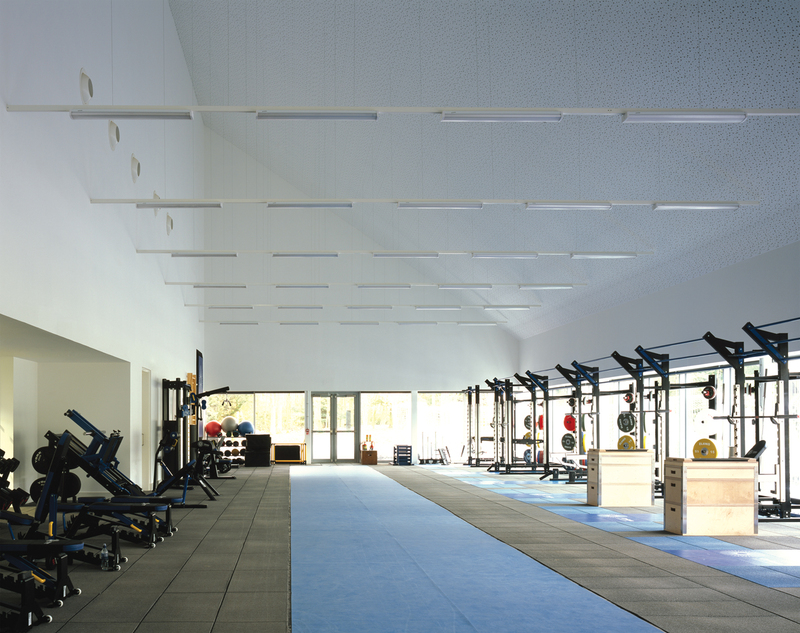 ‘Initially, the Sport Scotland brief required a lighting level of 1,500 lux for the sports hall, which was beyond the CIBSE recommendations for any of the proposed sports,’ says Palmer. ‘Our first energy-saving intervention was to negotiate this down to a peak installed level of 1,000 lux [for national level volleyball], with controls to facilitate lower light levels for other levels of play – 200 lux for training and 500 lux for regional matches,’ Palmer says. 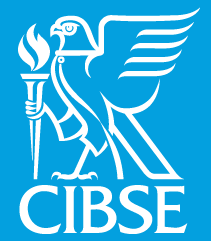 In line with CIBSE guidelines, the actual lux level will also vary depending on the sporting activity. 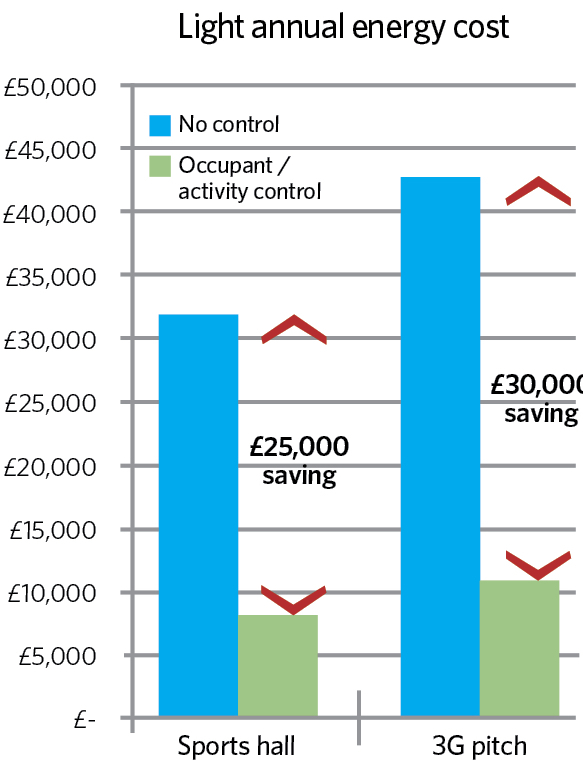 ‘Our energy monitoring has shown that the combination of daylighting, fine-tuned lighting control and the reduction in the peak light level has reduced the electrical load for lighting in the two main spaces by £70,000 per year,’ Palmer adds (see graph, left). The rooflights open under automatic actuator control, linked to temperature and CO2 levels in the hall. This enables the space to be naturally ventilated and to supply adequate ventilation for up to 850 people during graduation ceremonies. 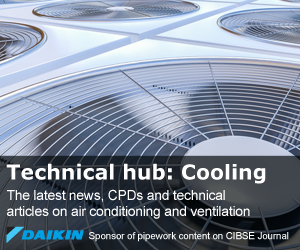 ‘We also carried out thermal comfort analysis to establish the peak summertime temperatures. This concluded that only in extreme summer conditions would cooling be required. For these infrequent occurrences, we developed a design strategy that would facilitate the installation of rented, temporary cooling plant for graduation ceremonies,’ says Palmer. The soft landings process was instrumental in fine-tuning the lighting, heating and ventilation control within the sports hall, to maximise comfort and reduce energy consumption. 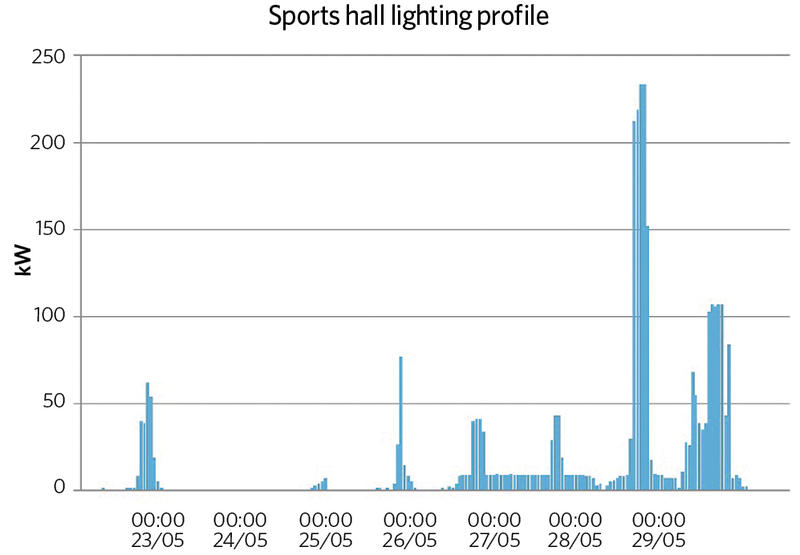 The sports hall lighting profile graph (below) for a typical week in April shows that, in general, the sports hall lighting has been switched off, or is on very low, most days. 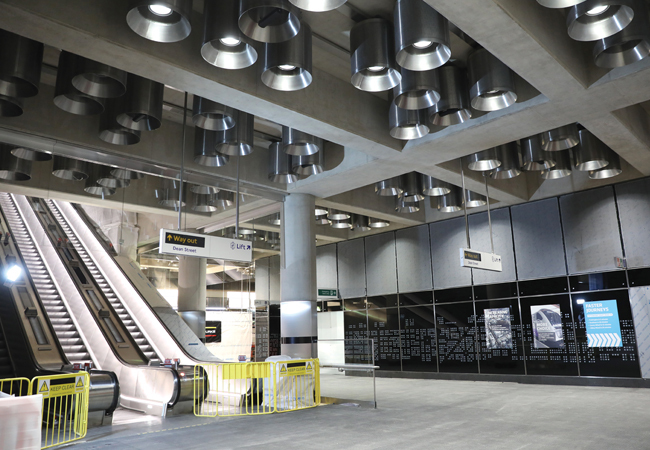 ‘This means there is often sufficient daylight available and that the staff are using the controls effectively, turning the lights on at a low level and only for the required zones,’ says Palmer. The fitness suite and first-floor dining area are also daylit through full-length windows along the side wall and a translucent polycarbonate end wall. Even the high-performance changing rooms have natural light from clerestory windows. The fitness suite was designed for high levels of occupancy, so the mechanical ventilation system is designed for a high ventilation rate. To minimise energy consumption, fresh air is controlled on CO2 to match the variable occupancy. A variable refrigerant flow (VRF) air conditioning system linked to an air-source heat pump cools the space via fan coil units. The VRF system is designed to transfer waste heat from the fitness suite to heat the café above. The underfloor heating in the sports hall, changing rooms, corridors and reception was originally designed to be served from a ground-source heat pump. However, budget constraints required the design to change to low-NOx gas-fired boilers. 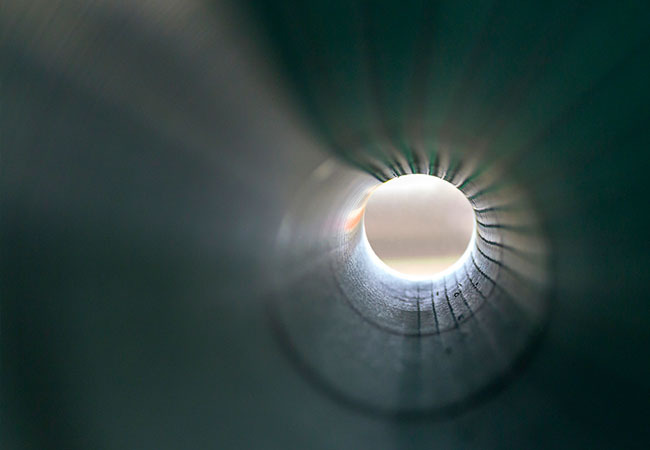 After one year of operation, total gas consumption was significantly less than had been predicted. ‘This is primarily because the showers are not being used as much as expected, with so many students preferring to shower back in their halls of residence on campus,’ explains Palmer. By contrast, electricity use was found to be more than had been predicted, possibly because unregulated loads from computers and gym equipment were higher than expected. Consumption is, however, expected to drop as the result of soft landings and the fine-tuning of controls and plant operation. For example, the over-door heater was found to be running 24/7 and the sports hall set-points were too high. Minor tweaks aside, this high-performance sports building succeeds in delivering a wide range of environmental conditions with minimal environmental impact. 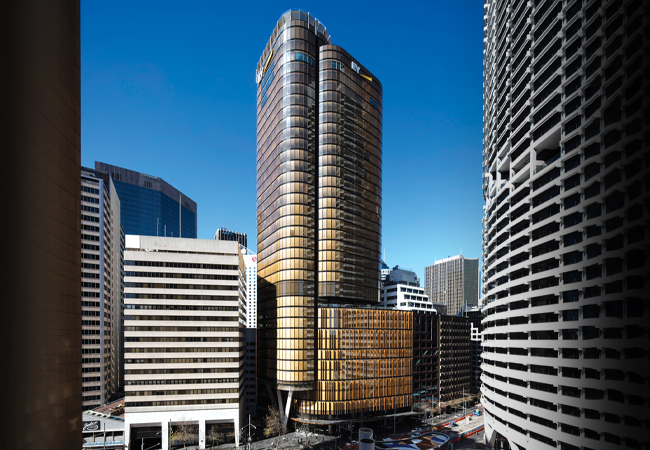 The building form and materials have been developed to offer extensive natural ventilation and daylighting to reduce the need for mechanical cooling, fan energy and artificial lighting. 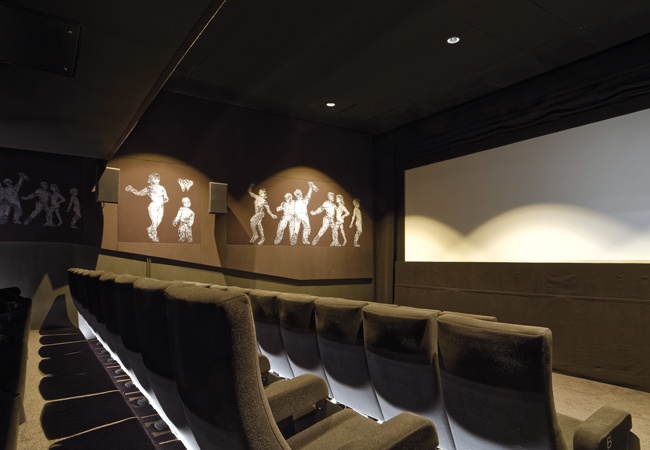 Perhaps unsurprisingly, the scheme won the Project of the Year – Leisure category at this year’s CIBSE Building Performance Awards – a worthy winner.